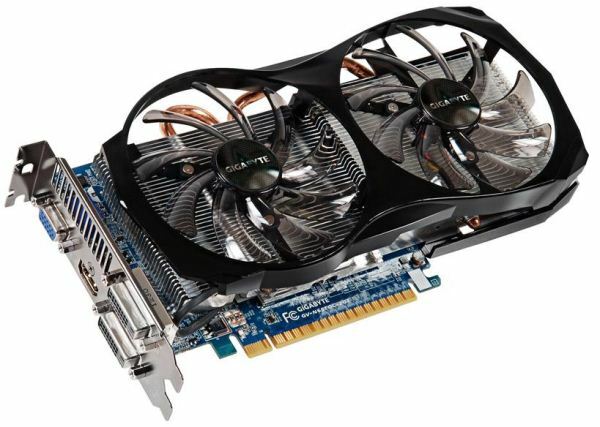 Earlier this week we reviewed NVIDIA’s GeForce GTX 650 Ti. As this was a hard launch many of NVIDIA’s partners have had their cards available for purchase from day-one, so we’re here to provide you with a summary of what’s available with this week’s launch. Before we dive into things we wanted to quickly point out that because of NVIDIA’s GTX 650 Ti Assassin’s Creed III promotion, prices are being distorted some. Manufacturers appear to be paying $5-$10 for the game, causing the price of most of these cards to come in over NVIDIA’s $149 MSRP. The only card initially available at Newegg at $149 is EVGA’s reference clocked card, which doesn’t include Assassin’s Creed III. (dimensions in mm) 8.39” x 4.72” x ??? (213.11 x 119.89 x ???) 6" x 4.38" x ??? (152.4 x 111.25 x ???) 6" x 4.38" x ??? (152.4 x 111.25 x ???) 6.88" x 4.37" x 1.51"
(dimensions in mm) ??? ??? 6.03" x 4.38" x 1.39"
4.37” x 6.03” x ??? Card dimensions should be taken as an estimate rather than a precise measurement, as manufacturers haven’t standardized the unit of measurement for their cards. Some cards were measured in inches while others were in metric. I’ve done the necessary conversions to both formats, but the physical product does not always match the dimensions given on the spec sheet. This card is among the largest of the lineup, due to its second fan, which should be taken into consideration with some setups. 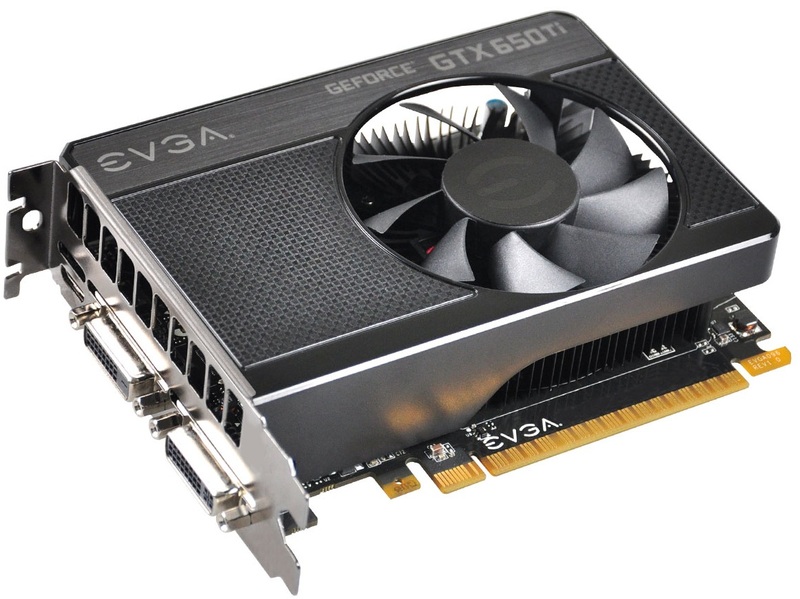 By skipping the Assassin’s Creed III promotion on their entry-level card, EVGA boasts the least expensive card of the competition by a slight margin. Meanwhile, for an investment of $10 you can get the Super Superclocked version (reviewed here) which includes Assassin’s Creed III along with a hefty factory core overclock of 15%. Based on NVIDIA’s reference design, the cards are also among the most compact of the bunch. 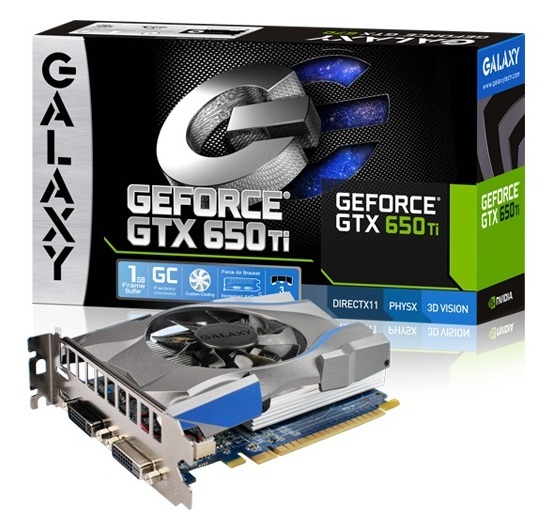 As with many other GTX 650 Ti cards launching today, Galaxy is seeding the market first with a factory overclocked model, with a shipping clockspeed of 966Mhz. Otherwise, Galaxy’s sole GTX 650 Ti is a fairly standard card, featuring a single-fan open air cooler and NVIDIA’s standard port configuration of 2 DVI ports alongside a mini-HDMI port. 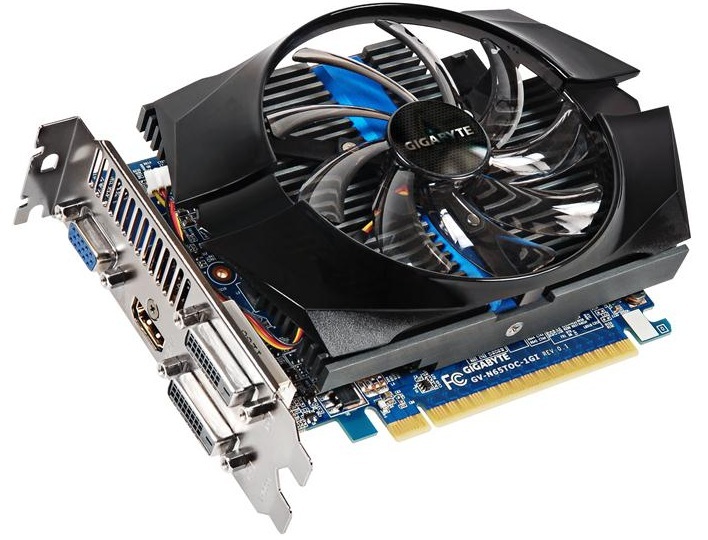 Gigabyte’s GTX 650 Ti “Triangle” is their entry-level GTX 650 Ti card, based on a short PCB (presumebly NVIDIA’s reference PCB) and equipped with an open air fan & heatsink combination that Gigabyte calls their Triangle cooler. Like Gigabyte’s other GTX 650 Ti this features a fairly large factory overclock, with the card shipping at 1032MHz. 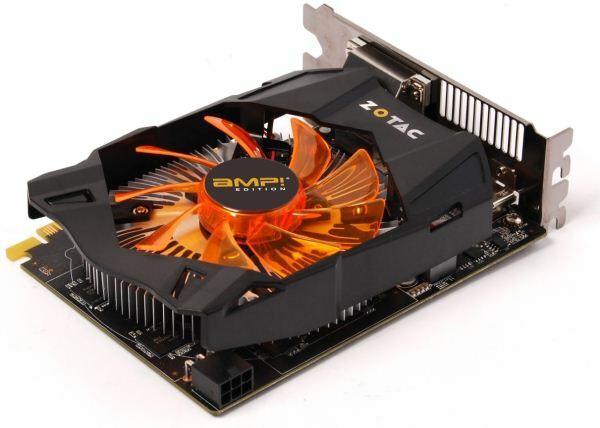 This card, which we have reviewed more in-depth, is the 2GB product for Gigabyte’s 650Ti line and is equipped with Gigabyte’s Windforce 2X cooler, which is composed of two 100mm fans mounted over a large aluminum heatsink. While the dimensions were not specified, the cooling system requires more space than most cards in the lineup due to the second fan. Like the Triangle this card ships with a 1032MHz factory overclock. 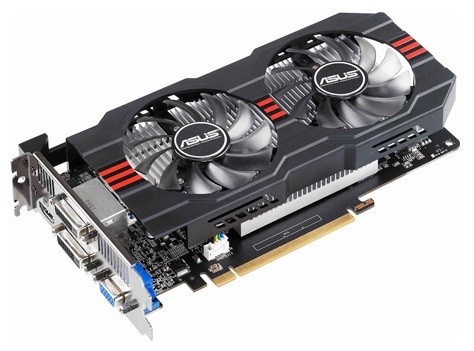 The largest card in the lineup, this card also has a 3-year parts and 2-year labor warranty, like most MSI graphics cards. 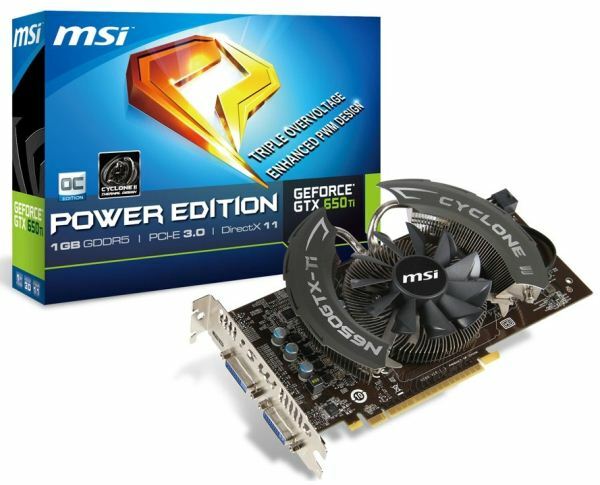 MSI is offering a mild factory overclock here shipping the card at 993MHz. Zotac is the only company in this lineup with a 2-year warranty, while also charging the highest premium for its cards. However, with product registration you can upgrade to an extended limited lifetime warranty, which may explain the increase in cost. Zotac also offers a factory overclock on this model –making them the only vendor to not offer a true reference clocked card – but at 941MHz the difference is trivial at best. 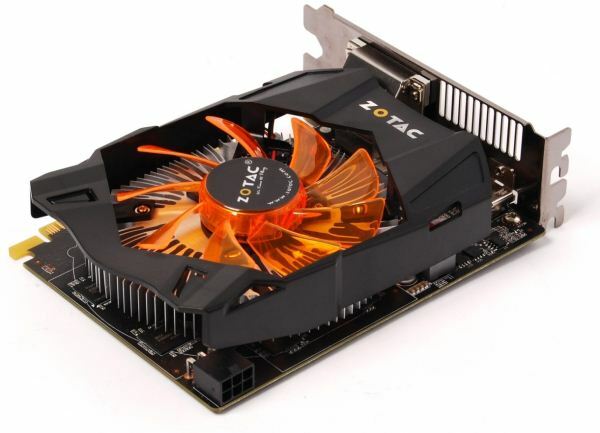 The Zotac AMP has all the features of the Zotac 650 Ti above, but it also is the only card in the lineup with a factory overclock on its memory, with Zotac having bumped it up to 6.2GHz. In our launch-day review this was among the best cards we reviewed, but also among the most expensive. Looks like they're going into the HTPC or microITX design low profile now? I always hated long cards, I've had problems with some long cards in the past and had to buy a different case because the long card would hit the HDD bracket. The old Gravis UltraSound back in the 90's was one of the longest cards I've ever had and was a headache to fit into my 486 at the time.